This fascinating half-day tour will focus on the contrast between the ancient Maya city of Altun Ha and modern day Belize City. Belize City today is home to about 35% of the country’s population and your guide will provide an interesting reflection of the city’s history. Note the colonial wooden architecture of many of the houses throughout your tour. Located 35 miles from Belize City on the Old Northern Highway, Altun Ha ("Rock Stone Water") thrived as a trading post to the Maya World during the Post Classic and Classic periods. It was here that Dr. Pendergrast uncovered what is considered to be perhaps the most precious of all Mayan artifacts and the largest piece of carved Jade in the Maya World -- the Jade Head representing Kinich Ahau, the Sun God. 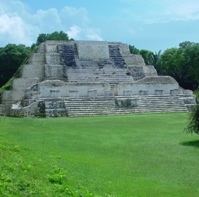 Altun Ha is easily accessible, and not a difficult walk. For those filling time before departing the country, a trip to this site is often made with a drop off at the International Airport. Pick up service is available at all Belize City hotels. Gatorland, "The Alligator Capital of the World"